New Jersey is the most densely populated state in the U.S. and has one of the highest pedestrian accident rates. Traffic accidents are the leading cause of death among children, and accidents involving school crossing guards have increased 65% in the last 10 years. A new video from the NJ Division of Highway Safety highlights the dangers around school zones. Carpool with neighbors or friends. Review and always follow your school’s student drop off plan. Drop your child off on the school side of the street, next to the curb. Follow instructions provided by school crossing guards. Slow down and comply with the posted speed limit not only in school zones, but where children are walking or biking along the road. Eliminate all distractions ‐‐ particularly cell phones and other electronic devices that reduce your ability to react quickly in driving situations involving young children and their spontaneous actions. 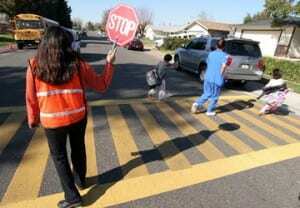 Teach your child to look all ways before crossing and to cross only in crosswalks or at corners. Make sure that everyone in your vehicle is properly restrained in the appropriate child safety seat or booster seat or seat belt. This entry was posted on Saturday, September 18th, 2010 at 5:19 am	and is filed under Pedestrian, Safety. You can follow any responses to this entry through the RSS 2.0 feed. Both comments and pings are currently closed.